Energy is everything in this world. Manufacturing, research, poetry – everything relies on energy. Not just any old energy will do, we’re spoiled. The global economy depends on a vast supply of amazingly inexpensive fuel. It’s easy to think that energy isn’t so cheap when you’re filling up your car once a week, but does anyone stop to consider the potential contained in a single gallon of gas? A semi-trailer truck can move itself plus another fifteen tons worth of brick a half-dozen miles for a cost of around three dollars. Would any rational person ever consider pushing the vehicle and its load that distance to spare the expense? Better still, how much would you pay to avoid pushing a fully loaded semi six miles? Hundreds? Thousands? And forget about rowing a cargo tanker across the ocean, you know with piracy like it is and all. Everyone knows that fossil fuels won’t last forever. Not only are they a non-renewable resource, they are also subject to the law of supply and demand. The less of the stuff there is, the more it will cost, so humanity will abandon it long before the proverbial well runs dry. Renewable energy sources are not usually as cost-effective, and most are unable to produce power with enough consistency to fill the demand of millions of users at once. For years I’ve heard that hydrogen is the next step. I would argue that hydrogen technology makes a nice portable fuel cell, but the amount of energy needed to electrolyze all of that water in order to extract the hydrogen is immense. This means that while it might soon replace the gas in your car, it won’t be a substitute for the fossil fuels that drive your local power plant in the near future. Nuclear fission is out. 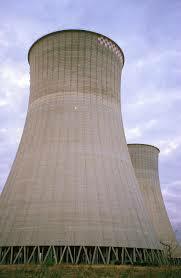 After the Three Mile Island incident and two decades of The Simpsons, the constituencies of politicians across the country made clear their loss of appetite for living in the figurative (and occasionally literal) shadow of nuclear cooling towers. As a result of the Three Mile Island event, no new fission power plant construction was approved for development in the US. We don’t like nuclear power so much, we’ve had at least one two-term president (amongst others) who couldn’t be bothered to pronounce the word properly. But all of that was back in the days of fission. The recent breakthroughs at the National Ignition Facility bring humanity as close as its ever been to the creation of fusion power. They’ve made themselves the most powerful laser gun in history by splitting a single beam into many and amplifying them over a quadrillion times. When fired, the lasers approach their target from all directions, are converted to UV light, and then blast in perfect synchronicity. They impact a small gold-plated cylinder called a holhraum which is designed to dissipate the laser beams internally as X-rays. These compress a pellet held within by a factor of a thousand (to around 1000 g/ml), and heat it to temperatures near 180 million F°. At this point the intense force compresses the nuclei in the target atoms into one another, creating heavier atoms and leftover radiant energy that’s released (mainly as alpha particles) in an outwardly radiating blast. The inside of the NIF target chamber then captures a portion of this excess energy and stores it. These recent tests were thirty times weaker than necessary for fusion, but serve as a valuable frame of reference. The scientists at the NIF know that they are on the right track. The gun is powerful enough for the job, and they feel confident that they successfully addressed problems involving asymmetrical heating and laser-plasma interaction that plagued others in the past. Predictions are flying that a fusion reaction will occur by the end of the year. Unfortunately, this design isn’t optimized for power production. Of the 4 megajoules (MJ) worth of energy needed to power the lasers, less than one makes it to the target. The ensuing explosion can create as much as 45 MJ (around 11 kg of TNT) of energy in the current design. The gun is engineered to fire 700 times a year, generating about 31.5 gigajoules of power. That sounds like a lot of energy, but it only translates to 8.5 tons of TNT. Sort of a let down, I know. At that rate, it would take 2500 years of uninterrupted production to capture as much energy as was released by the atomic bomb dropped on Nagasaki. Hopefully second generation fusion reactors designed as power plants will be significantly more productive, but let’s get this one fusing first. ~ by Wil Finley on February 15, 2010.